Juries handed down nearly $1.2 billion in some of the biggest medical product and health-related verdicts of 2017. Verdicts over talcum powder products, hip replacements and testosterone replacement therapy dominated the list even as a major U.S. Supreme Court decision promised to reshape the way lawsuits make their way to court. Johnson & Johnson was on the losing end of seven out of the 10 largest verdicts. J&J is the world’s largest medical company, manufacturing everything from medical devices to drugs to household products. The company saw products from across its manufacturing spectrum in court. The top five jury awards alone totaled more than $1 billion; although, the year’s largest verdict – for $417 million – was later overturned. Still, companies including Johnson & Johnson, AbbVie Inc. and GlaxoSmith Kline were ordered to pay hundreds of millions to patients who claimed to be injured by the companies’ products. Talc lawsuits experienced a turbulent year in 2017 — thanks to a U.S. Supreme Court ruling that sent shockwaves through the legal landscape in June. Juries in California and Missouri handed down three large verdicts totaling nearly $600 million in 2017, but the Supreme Court decision led to two of those awards being overturned. May: A St. Louis jury awarded a $110 million talc verdict to a Virginia woman who claimed Johnson & Johnson’s talcum powder products caused her ovarian cancer. August: Jurors in Los Angeles awarded $417 million to woman who claimed Johnson & Johnson talcum products caused her ovarian cancer. October: A Missouri appeals court threw out a $72 million talc verdict saying neither the plaintiff nor Johnson & Johnson (the company she sued) were from Missouri. The court cited the Supreme Court’s Bristol-Myers Squibb decision. October: A California judge overturned a record $417 million verdict in a talc lawsuit that claimed Johnson & Johnson’s Baby Powder and Shower to Shower talcum products led to ovarian cancer. November: A Missouri Circuit Court upheld a $110 million talc verdict against Johnson & Johnson, despite the Bristol-Myers Squibb decision. The court found that a Missouri company, PTI Union LLC, had manufactured, packaged and labeled Johnson & Johnson’s talc products, giving Missouri jurisdiction in talc lawsuits against the company. Studies since the 1960s have shown an association between using talc for feminine hygiene and ovarian cancer. But manufacturers failed for years to add a warning about ovarian cancer risks to talcum powder products. In June, a U.S. Supreme Court victory for Bristol-Myers Squibb gave medical product makers new advantages in how lawsuits are filed in state courts. The decision led to at least two major talcum powder verdicts being overturned while attorneys and the people they represent were left looking at new strategies to pursue damages when medical products injure patients. The case, Bristol-Myers Squibb Co. v. Superior Court of California, limited the jurisdiction where lawsuits can be filed to the state in which the companies are based or to the state where the person filing the lawsuit was actually harmed. The Squibb case involved the blood thinning drug Plavix, but the ruling immediately affected lawsuits that claim talcum powders had caused ovarian cancer. Many of these lawsuits had been filed in state courts in California or Missouri. However, another talc verdict for $110 million out of Missouri was reinstated after a state judge determined Johnson & Johnson had sufficient ties to Missouri to warrant jurisdiction. A string of court losses over DePuy’s Pinnacle hip replacements continued into 2017. By the end of the year, DePuy had lost a total of $1.7 billion in three consecutive jury verdicts. The company’s only silver lining came from judges reducing the punitive awards due to limits imposed by Texas state law. January: A federal judge slashed in half a $1 billion punitive damages award to six plaintiffs over DePuy’s Pinnacle hip implant. The court kept the jury’s award of between $4 and $6 million in actual damages intact. November: A Dallas jury awards a $247 million verdict to six plaintiffs in the fourth Pinnacle hip replacement bellwether trial. The Pinnacle verdicts have come in bellwether trials as part of a multidistrict litigation, or MDL. MDLs combine similar lawsuits in federal court to move them more efficiently through the legal process. Bellwether trials are test cases pulled from these lawsuits to measure how juries react. They can help both sides shape eventual settlements. 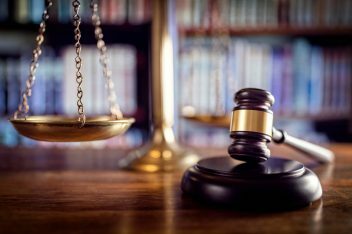 After losing the third of four bellwether trials, some court-watchers expected mounting court losses could pressure DePuy to offer a settlement in the Pinnacle cases. But as of Dec. 18, there were 9,308 Pinnacle lawsuits still pending in a federal multidistrict litigation, and the company appeared poised to continue with further bellwether trials in 2018. The first three bellwether trials in a testosterone replacement therapy multidistrict litigation resulted in $290 million in jury verdicts in 2017, though a judge overturned one of those verdicts in December. The Chicago-based federal litigation involves multiple companies, which is rare in MDLs. July: A federal jury awarded $150 million to a man who suffered a heart attack after taking AbbVie’s AndroGel testosterone therapy treatment for four years. October: Chicago jurors awarded a $140 million verdict to a man who argued in a testosterone replacement therapy bellwether trial that AndroGel caused his heart attack. November: A jury sided with Endo International’s Auxilium subsidiary in the first lawsuit over its testosterone replacement therapy drug, Testim. December: An Illinois federal judge overturned $150 million in punitive damages awarded in the first AndroGel bellwether trial, ordering that the case be retried in March 2018. As of December 2017, there were 6,121 lawsuits still pending in the testosterone replacement therapy MDL. The final bellwether trials are expected to wrap up in 2018. After a string of victories for Johnson & Johnson in a multidistrict litigation involving the company’s Xarelto blood-thinner, the company was hit with a nearly $28 million verdict in a separate Xarelto state litigation in Pennsylvania. The company had won all three Xarelto bellwethers in the MDL. But hundreds more lawsuits over the drug were consolidated in Pennsylvania state court. The $27.8 million verdict came in the first of the state cases to go to trial. May: A New Orleans jury sided with Johnson & Johnson and Bayer in the first federal bellwether trial over Xarelto in the federal MDL. June: Bayer and Johnson & Johnson won the second bellwether trial over the blood-thinner Xarelto. August: Federal jurors sided with Johnson & Johnson and Bayer in the third MDL bellwether trial over Xarelto. December: In the first state Xarelto trial, a Philadelphia jury awarded a $28 million verdict against Johnson & Johnson and Bayer. December: A S. District Court denied Dora Mingo’s bid for a new trial after she lost the third bellwether lawsuit in federal court. As of December 2017, there were 19,594 Xarelto lawsuits still pending in the federal MDL and more than 1,500 in the Pennsylvania consolidated litigation. Litigation exploded in Australia and the U.K. over pelvic mesh as cases geared up in the U.S.
A rising tide of patient complaints and lawsuits overseas led regulators in New Zealand to ban transvaginal mesh. Australia severely limited its use, and the U.K.’s medical device watchdog stopped short of recommending a complete ban while calling on the National Health Service to limit its uses to “research purposes.” The U.S. Food and Drug Administration has yet to comment on pelvic mesh bans in the U.S. or elsewhere. Two lawsuits in the U.S. led to a total of $35 million for two women who claimed they were injured by the mesh. Meanwhile, a mesh manufacturer offered hundreds of millions of dollars to settle thousands of lawsuits it faced. April: A New Jersey woman won a $20 million verdict in a Philadelphia courtroom for complications she claimed were caused by pelvic mesh manufactured by Johnson & Johnson’s Ethicon division. August: Endo International agreed to pay $775 million to settle roughly 22,000 transvaginal mesh lawsuits. December: A state court jury in New Jersey awarded $15 million to a Hackensack woman for pain and suffering, loss of conjugal affection and in punitive damages. People have filed more than 100,000 pelvic mesh lawsuits that have been included in six MDLs since 2010. As of December 2017, the Judicial Panel on Multidistrict Litigation reported 25,873 cases were still pending. Wright Medical offered $90 million to settle all remaining lawsuits the company faced over its former hip replacement division. The settlement would close a chapter in the company’s history. Wright has been out of the hip implant business since selling its OrthoRecon division in 2013. At the same time, implantable blood clot filters and the first verdicts in a case involving surgical devices blamed for spreading infections were among the beginnings of new series of cases expected to stretch into 2018 and beyond. April: A jury awarded $3 million to the wife of a man who committed suicide after taking a generic form of the antidepressant Paxil. Notably, the generic manufacturer was not held liable for the verdict, but the original developer of the drug, GlaxoSmithKline, was ordered to pay. May: Johnson & Johnson agreed to pay $33 million to roughly 40 states and the District of Columbia to settle consumer-fraud charges over at least 10 of its medical products. June: AbbVie lost a $15 million federal court verdict to a woman who claimed the company’s Depakote — used to treat her bipolar disorder while pregnant — caused her son’s birth defects. July: A Seattle jury handed down a $6.6 million verdict against Olympus, determining the company’s duodenoscopes were responsible for a deadly superbug outbreak at Virginia Mason Hospital. The jury instructed the hospital to pay $1 million of the verdict to the family of a man who died from the infection following a duodenoscope procedure. October: Wright Medical agreed to pay $90 million to settle roughly 600 remaining lawsuits over its metal-on-metal hip implants. November: Cook Medical won a unanimous verdict in first bellwether trial over its Celect IVC filter. November: A New York federal judge dismissed more than 50 lawsuits claiming the blood-thinner Eliquis caused life-threatening complications. The U.S. Judicial Panel on Multidistrict Litigation created eight new multidistrict litigations in 2017 and disbanded five older ones. MDLs allow several lawsuits to be combined into a federal case to move more quickly and inexpensively through the legal process. New lawsuits can join MDLs in the years it takes for them to play out. In many instances, MDLs that have started with a handful of lawsuits have included thousands by the time they finally go to trial. The Judicial Panel on Multidistrict Litigation also terminated several drug and device MDLs in 2017, after cases were settled or tried. Lawsuits that remain after an MDL is terminated are usually returned to the court where they were first filed. That court can determine if the case should go to trial or be dismissed. The health-related products that generated 2017’s top verdicts promise to be among the most watched cases in 2018. Talc and testosterone lawsuits remain on court schedules into the new year, including the retrial of the AndroGel case in March. The talc cases centered in state courts may see some realignment in light of the Bristol-Myers Squibb decision. There are also three more Pinnacle hip bellwether trials scheduled, and continued losses could create new pressure for DePuy to move toward a settlement. In addition, judges overseeing several MDLs have scheduled the ligations’ first bellwether trials to begin in 2018. Their outcomes could give an idea of potential settlements down the road. Bard IVC filters — there are 3,294 lawsuits pending against Bard in an MDL over these implantable filters designed to catch blood clots. People who filed suit claimed the devices migrated through their bodies, broke or caused other serious injuries including death. Bair Hugger surgical warming systems — As of December 2017, there were 4,133 lawsuits claiming the devices led to infections that involved complications as serious as amputation and death. Ethicon Physiomesh hernia mesh — There are 436 lawsuits currently in the Physiomesh Flexible Composite Hernia Mesh lawsuit claiming patients suffered bowel obstruction, organ perforation and other serious complications. Abilify — As of December 2017, 441 lawsuits had been filed claiming this antipsychotic drug led to compulsive behavior including gambling addictions. Invokana and other SGLT2 inhibitors — As of December 2017, there were 952 lawsuits that claim the diabetes drugs caused a range of kidney injuries and other serious complications, including deaths. Taxotere — There were 3,129 lawsuits pending over this chemotherapy drug that has been blamed for permanent hair loss. State and local governments in 2017 continued to sue pharmaceutical companies and distributors over costs related to the opioid epidemic. The federal Judicial Panel on Multidistrict Litigation consolidated the first 46 opioid cases into the National Prescription Opiate Litigation on Dec. 5, 2017. By Dec. 18, 2017, the MDL included 183 lawsuits. Legal experts have compared the MDL to the landmark litigation against tobacco companies two decades ago. That legal battle ended in a $206 billion settlement from four manufacturers. Most MDLs involve only one or a few defendants, but the opioid MDL names at least nine companies that either manufactured or distributed the prescription drugs. The plaintiffs in the MDL are all municipalities, counties and states. Responding to the spike in opioid-related overdoses has been expensive for local responders and state health and legal systems. In October 2017, Ohio State University researchers estimated that Ohio was paying as much as $8.8 billion a year to address the epidemic.